Visit to Red Robin was sponsored by Red Robin, Opinions, Images are my own! I am all about taking the heat out of my kitchen and letting someone else serve up the food and I make sure we head out to eat at least once a week. Hectic schedules, crazy days and a clock that never stops all contribute to not wanting to create a meal at home and the need to just relax and unwind in a family friendly atmosphere. Do you have a place in your home that your kids love to go to for the food and a place where they are not ‘hushed’ when they giggle and carry-on? A challenge that every family endures is where can you dine that meets a little bit of everything someone in your family is looking for? My one son has severe food allergies which of course throws us a curve-ball, but knowing where to eat across our nation and in Pittsburgh let’s us dine out without worry. I personally head out for libations combined with appetizers, while my husband loves his burgers, and the kids love Bottomless Fries and sports television. Where can you go for gourmet burgers, delicious craveables, signature mixology beverages? My feature this week will offer you a story of 3 Reasons to Eat At Red Robin! My list of reasons to dine at Red Robin is so extensive and choosing just three reasons was really hard but I did it! 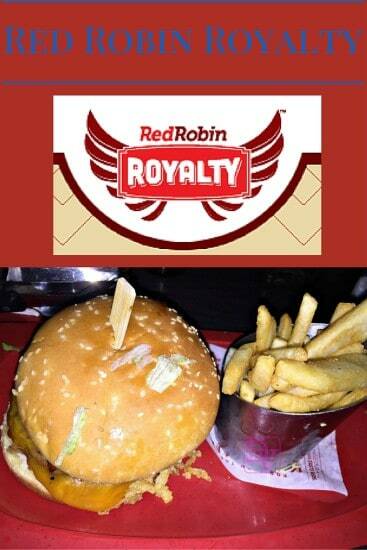 Red Robin has a smashing loyalty rewards program…think ROYALTY. If you have not done so, sign up online, as you will get some great perks while you are dining there. While that is not one of my 3 Reasons to Eat At Red Robin it does have something to do with it, lol! Did you know that if you sign up for the Red Robin loyalty rewards program, you are offered added perks when you dine at the Red Robin restaurants throughout the year across the nation? There are over 500 Red Robin Restaurants across the USA and Canada, so that is a lot of rewards being given! Here’s one you might know have known: for ever 10th item purchased at Red Robin is free! There is so much more, but go to the Red Robin website to register, it only takes a few minutes to register online! Once you are registered you will learn my Reason #2 for eating at Red Robin. Who would have thought a gourmet burger, crafted by the Gourmet Burger Authority would turn into a way to support local schools with kids in grades K-12? That’s right, it is called Burgers For Better Schools, and the program contributes to the school of your choice as long as you have a Red Robin Royalty account(which is free). 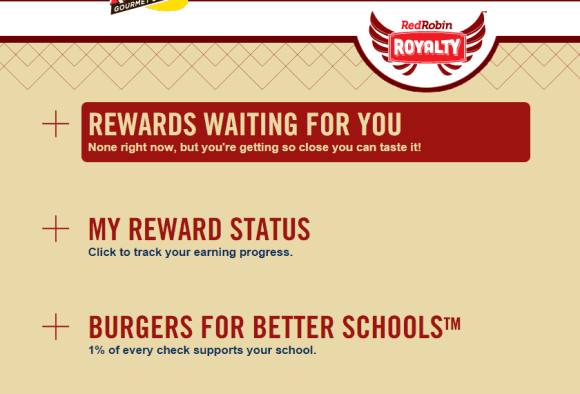 Simply go online and sign into your account, and make sure that you present your account number when you purchase your meal at Red Robin and 1% of your total bill is then contributed to the school you chose! Ka-Ching or should I say Burger-KaChing lol! If you kids move into different schools, you can change your selection at any point in time via your account. Now on to the meat and potatoes part of the story— oh I am so funny! 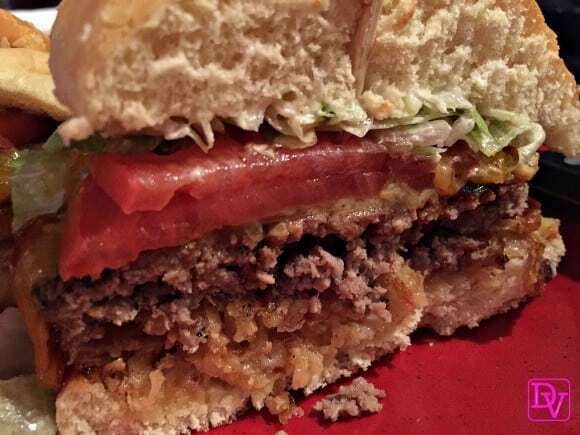 Does this just make you CRAVE a burger? 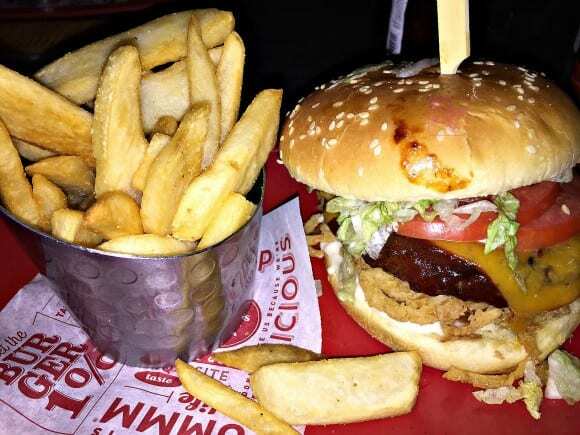 What story about Red Robin would be complete without showing you the mouthwatering, stacked, gourmet burgers and bottomless fries our table enjoyed. Again, my son has severe food allergies* ranging from nuts to latex and everything in between. We notify our server every-time we dine there to make sure that he can eat, and verify his food will not come into contact with foods he can’t have or latex and every time, and each location we have eaten at has met our needs! If you have food allergies, make sure to notify your server and ask questions, as our allergies differ from yours! Did you know that at Red Robin, every meal is made-to-order? Our most recent dining experience was in Cranberry Township, Pennsylvania and he was thrilled to have fries and a burger! As for the rest of us, we dined on burgers(meatless and meat-laden) and Bottomless Fries until our stomachs caved! Now you know the 3 Reasons to eat at Red Robin so what are you waiting for? Are you ready to lavishly live gourmet burgers out loud, and contribute to your school of choice? What is your favorite burger? Winner!! THANK YOU SO MUCH!! Sent email. I love the Onion Rings at Red Robin. I would get the Whiskey River BBQ. I would get the Whiskey River BBQ burger. I would get a burger and their endless fries! mushrooms and swiss burger is my favorite! I would have a cheeseburger and onion rings! Gourmet Burger and bottomless fries. I’m vegetarian so I’m going to have to go with the Garden Burger with extra pickles and tomatoes! Blue Cheese burger with all the fixins! I’d order the Whiskey River Bbq Chicken Wrap with fries. endless fries with dipping sauces! I would love to get a bacon cheeseburger… right about now! A big juicy burger with mayo, ketchup and mustard and onion and fries!!! I love everything, but ALWAYS scarf down the fries. So I will eat fries at Red Robin! I love their chicken wraps they are very good I have had them quite a few times there as I am actually not a hamburger person but my husband is. I do love their steak fries too. I would order the Nantucket Seafood Platter. I want a juicy cheddar burger with bottomless fries and a coke! Whiskey River burger with veggie patty! I love their burgers! I always order a burger with bacon! I would eat the Prime Chophouse burger! I am looking forward to bottomless fries! Oh my, the Whiskey River BBQ Burger has got to be the best burger ever! I haven’t had one in a long time so it looks like it could be a great time to go to Red Robin! I would love to try the guacamole bacon burger! I love eating there on special occasions, I love the chili chili cheeseburger love chili! I’d like to try a Hawaiian style burger and fries. I would get the Whiskey River Barbecue Chicken Sandwich!! The bacon cheesburger and bottomless fries sound awesome! I need to go there and try it out! Love to try Red Robbin burgers! Endless fries all the way! I love the bleu cheese burger. I would have the bacon hamburger with lots of fries! Fries for sure and the whiskey river chicken thing sounds good! I would have a mushroom n swiss with grill onions and bottomless fries! I love their mushroom burger! My son loves singing the song from the commercial! My favorite is the Tavern Double and of course the bottomless fries! I would definitely eat the shroom burger! The Bleu cheese burger and bottomless fries. I love the DGB (Damn Good Burger)! I have never eaten there but I would love to try one of their gourmet burgers,hopefully a spicy one,I like it hot! and I’m a big fries fan so it’s a good thing they are bottomless!! Would love to have bottomless fries and the strawberry lemonade. I always want the Bacon Cheeseburger with bottomless fries! I’ll be eating the black and bleu burger with lots of bottomless fries! Red ‘Robin I have heard has good food but we don’t have one here in our area. I will have to share this with my sister who has a Red Robin in her area. Thanks for sharing. I’d like the great norther poutine fries for an appetizer. Then, for dinner I’d like the Ensenada Chicken with bottomless broccoli. And for dessert, I’d like the spiced pumpkin pie milkshake. YUM! Onion Rings or Bottomless fries hands down. The Prime Chophouse is the one I would love to try it sounds wonderful they all do. I will get Red Robin Gourmet Cheeseburger. I’d get the garden burger on an onion bun! Yum! I would order a bacon cheeseburger and bottomless fries. I LOVE their seasoning for the fries it is so yummy. I’d get the garden burger. I am thinking the Bacon Cheeseburger! I love the burger with mushrooms. The fries are always hot and fresh. I love anything and everything with BBQ sauce on it so the Whiskey River BBQ burger is right up my alley! My favorite is the teriyaki burger! The pineapple totally brings everything together plus the bottomless fries with ranch…the bomb dot com! I love the Whiskey River Burger! I always get the tower of onion rings and the crispy chicken sandwich with the endless fries. I love the Whiskey River Burger. I’ve never ate at Red Robin, but the Royal Red Robin burger looks great! Bacon cheeseburger is what I would get!!! I would love to eat the Prime ChopHouse Burger. The Bleu Ribbon Burgers is to die for!!!!!!!! And I hated blue cheese for 30 years!!!!!!!! the bacon cheeseburger and bottomless fries!! Bottomless Fries seem to be the favorite! Bacon Cheeseburger fries and a glass of cold beer. I have a hard time with what to choose at Red Robins as everything looks so good and I love their burgers. I would like to try the Bleu Ribbon Burger. I love their seasoned fries too. Reading your article reminded me of how good they were about my food allergies too. I love a restaurant that cares enough to help you so you can enjoy eating out once in a while. Red Robin is outstanding with food allergies and I am happy there are 500+ ..
the Bottomless Fries are #1 on the list!!! I love Red Robin. Great salad bar and burgers. I would eat any burger with Mushrooms and a side of onion rings. Forgot, I try something different everytime I go but always get fries and the sauce. Love it. I try something different everytime too.. To eat at least one more fry, lol! I love Red Robbin. I will definitely visit again soon. Yes, i will eat there. I’ve had the SAUTEED ‘SHROOM burger with a slice of sharp cheddar which was delious, and the bottomless fries were wonderful. I couldn’t eat any thing else for the rest of the day! I would like to try the Clucks and Fries. Yum! I <3 their Cheeseburgers with grilled onions! We don’t have Red Robin here but they have great burgers. Id eat the royal red robin burger. Burger, bottomless fries and cold beverages. I like the burger with the bleu cheese in it…I think it’s called the Bleu Ribbon burger….mmmmmmm!!! I usually order the BLTA -A, with freckled lemonade. YUM! I like the shroom burger and that is what I would order again! I will get a bacon cheeseburger. I have never been there but everything sounds, well, good enough to eat! I will eat a cheese burger and fries. I will be eating their veggie burger and of course, the fries! Yummmmmm! I would have the RED ROBIN GOURMET CHEESEBURGER! I would eat the Royal Red Robin Burger. What could be better than a burger and fried egg in one! Delicious. Add in their Strawberry Lemonade, and I am set! i would like to try the banzai burger and the bottomless fries! I’d eat one of their juicy burgers, the Burnin’ Love Burger to be exact! Oh I would definitely get the SAUTÉED ‘SHROOM burger. Amazing! I would like to try their Bleu Ribbon burger. thanks! I love to eat the Banzai Salad it is so good but I also love the burgers! anything Salad is good to me! I need a Banzai Burger and some fries with ranch and campfire sauce!! Oh nom nom nom…. I want to try the Bansai Burger. I would get a whiskey River bbq style veggie burger! Onion Straws and BBQ makes this a prime choice! I like the clucks & fries, Thanks. I would get the clucks and fries. I would choose their veggie burger. I get the Jalapeno Coins for sure EVERY time! My absolute favorite…plus usually the BBQ Chicken Wrap! Isn’t amazing how something like a Jalapeno can be even better! I love the pretzel nugget appetizers and the sweet potato fries, as well as the A1 Peppercorn Burger. I just love there double bacon cheese burgers. yummy. I would get the American patty melt. Yum!! I love to order either the Garden burger or the crispy chicken sandwich! Oh I would love to have their Bacon Cheeseburger on the gluten free bun! I will get a petite bacon cheeseburger and freckled fruit. My husband and I love their wraps! The whiskey river bbq wrap is a favorite! Oh I once did a wrap there #Meatless. I don’t eat meat, my family does. It was Divine! The grilled turkey burger and the veggie burger both sound delicious. I am crazy about their burgers! Also the bottomless fries are for the win! I would eat the grilled turkey burger! I appreciate restaurants that have their own apps, it makes me feel like it’s easier to contact them. I always download apps from restaurants that I enjoy eating at. I Would Eat The Bacon Cheeseburger! I want the veggie burger and those bottomless fries. yum yum. Just go to their site, and use the location finder, I sure hope you can find one! I love their Chef Salad’s with the A1 Burger! See you are the 2nd person to tell me that:) I have to try that one! Ohhh i love this! the burger was look delicious i wish we had a near Red robin at my place i will tell this to my sister. Don’t think I have ever eaten here and whether we have one in my city! Three great reasons though! I would love to try the chophouse burger and the stack of onion rings. Yes I would try the American Patty Melt! I love the cheeseburger and the tower of onion rings! I love the whiskey river bbq burger! My one son Loves that burger. I used to eat it before I gave up meat! I will eat a bacon cheeseburger! I will eat the Guacamole Bacon Burger. These are three great reasons to eat at Red Robin. The picture of the burger sold me! My favorite thing to eat at Red Robin is the teriyaki chicken burger. . I love the BBQ whiskey chicken sandwich and onion rings. I will have the a-vo cobb-o salad. I love the Banzai Burger! I never knew they contributed to schools . So awesome! I would get a banzai burger. They have a great selection of burgers, so you can’t go wrong. You are right, they have great burgers and the Bottomless Fries are my fav! Red Robin is great and a lot of fun when bringing the family or friends. Jason Young recently posted..How do You Know if it’s Time to Redefine your Blog’s Niche? The southern charm burger ,Avo-cobb-0,with some margaritas and mountain high Mudd pie.. I LOVE Red Robin’s but I always forget to go there for some reason! I’ll definitely have to go back soon for some bottomless fries! Oh yes, you don’t want to forget about Red Robin.. They are an awesome community partner! Looks delicious! The burgers look the most attractive. You are making my mouth water. They are really presented well. Meatless or meat! I am going to get the Bacon Cheeseburger and unlimited fries. Red Robin’s burgers are so good! Oh I LOVE Red Robbin and I am in their royalty program too! Bottomless fries are THE BEST but their burgers are AMAZING! Thanks for the chance to win a gift card! That is a BIG one too! Joely Smith recently posted..Bond & Knight Personalized Men’s Wallets Great Gift For The Holidays! Discount Code In Post! I love the the Whiskey BBQ Burger and I love, love, love the endless fries!! Ohhhh! The burgers with fries look so delicious. I am not sure if we have try Red Robin but I doubt it. I will check it. Thank you so much for sharing. I only need one – the campfire sauce. It is the best thing since sliced bread. We seriously LOVE the Red Robin.